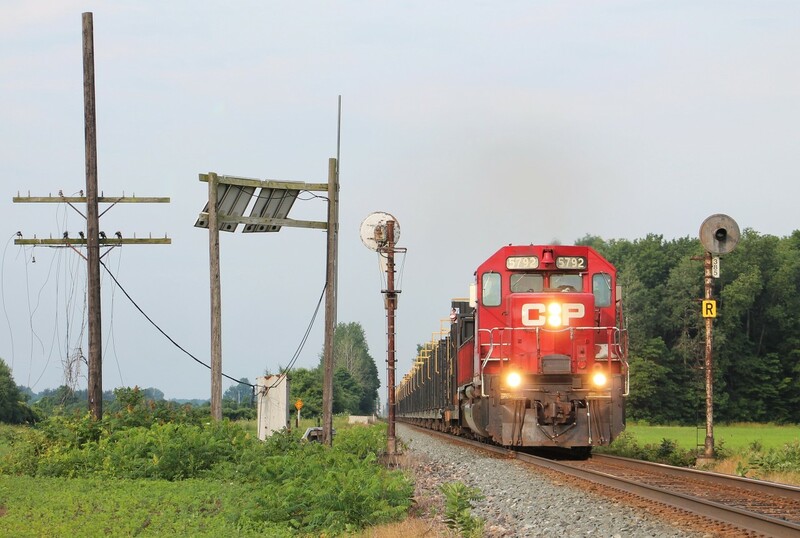 Railpictures.ca - Mike Molnar Photo: This is the third and final shot we got of the CWR train back in early July. After the rail train met 141 in Bothwell, we went east and discovered these classic bi-directional searchlights on accident near a crossing. Apart from the solar panel, this scene has been largely untouched and it was a treat to see a classic SD40 leading past them. As far as I know, these are one of the last sets left like this on CP in Southwestern Ontario. | Railpictures.ca – Canadian Railway Photography – photographie ferroviaire Canadienne. Caption: This is the third and final shot we got of the CWR train back in early July. After the rail train met 141 in Bothwell, we went east and discovered these classic bi-directional searchlights on accident near a crossing. Apart from the solar panel, this scene has been largely untouched and it was a treat to see a classic SD40 leading past them. As far as I know, these are one of the last sets left like this on CP in Southwestern Ontario.